This is an excellent first novel. The ideas and concepts, although reminiscent of The Giver and the movie Surrogates, were intriguing and the main driving force of the plot. (I'm a sucker for dystopian/sci-fi movies and books.) I also applaud Quick's world-building: the scenes and settings were well-described and easy to picture. The opening scene is stellar! I'm looking forward to reading the next installment in the series, since this one ended on a major cliff hanger. I want to delve deeper into things that worked for me as a reader, and things that I feel needed a little more polishing to really shine. Things that worked: I liked the integration of the Irish culture and legends, the sense of folklore and magic behind the sci-fi/dystopian setting. I also loved the Irish names. They're all so beautiful! (Sometimes, though, the Irish accent or phrases seemed a little out of place in the dialogue, especially since the setting is futuristic.) I also enjoyed the symbols integrated in the story, such as the 5-circle dream-maker's symbol and the spider (stitched on official's clothes but also the machine). I like the idea of people using dreams as escapism and entertainment. It's so reflective of today's culture and our addiction to technology and social media. Things that need a little polishing: For me, I feel like the dialogue doesn't flow naturally. The lines are somewhat cheesy or cliche, especially the lines between the two main characters Deidre and Flynn. The writing style is somewhat distracting in that the word choice is sometimes "off" and makes me have to do a double-take and re-read a sentence. I'm not sure how to describe this, except that writing should flow and not bring attention to itself. It needs to be fairly lyrical and not have repetition, etc. The writing style also was a little too step-by-step, with too much chronological description of what the characters were doing or what was going on in the scene. 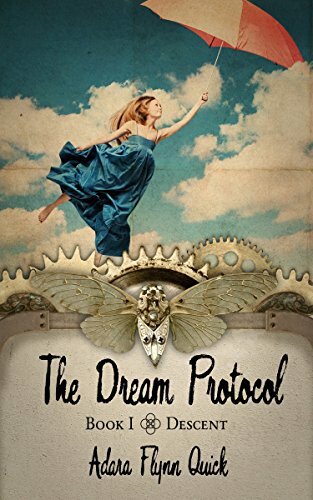 There are also a few small inconsistencies like characters knowing each others' names when they've never met, and I wondered how the dream weavers knew how to create realistic dreams unless they had experienced the "topside" or real world themselves. Additionally, some of the interactions between characters were cliche or just didn't seem to make since. Deidre seems excessively sassy to her parents, especially her father. I wanted more back story on why they didn't see eye to eye. There's so many stories of teens with angst against adults, and I feel that they need a reason for this angst for it not to seem like an over-done thing. The first meeting of Deidre and Flynn confused me also. Deidre diverts the unwanted attention on Flynn in the scene by randomly grabbing Flynn's hand, announcing he's her boyfriend, and running off from the adult figures with him. I was puzzled. Overall, the ideas and questions this story raises are interesting, and the concepts behind the story are enough to make me want to read the upcoming books.